Perera, 23, moved to Colombo to study graphic design — which is how he earns a living now — and discovered a whole new world of electronic music. He began producing his own stuff, learning the ropes alongside his friend and roommate, Alexxo. It’s around this time that he met Asvajit Boyle, an influential figure in the Colombo electronic circuit, who sort of mentored Perera and taught him a lot about production. Perera, in the past three years, has been fairly prolific in his work, and is a part of the Sri Lankan indie collective/label Jambutek Recordings. Now, he’s in Berlin as one of the selected candidates for BMR, and he can barely contain himself. Actually, he’s in Koblenz — around 600 km from Berlin — for a couple of days when we speak. 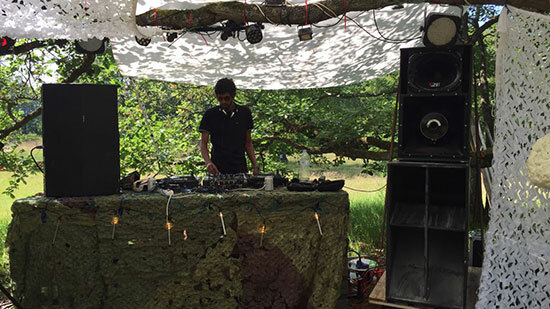 He’s there to play a gig in a forest; he’d met a member of the organising collective in Sri Lanka and they stayed in touch, resulting in this gig. He’s a few weeks into his two-month residency, for which he has many, many plans. More than anything else though, Perera is just thrilled at this opportunity to expand his horizon in such a way. He tells how, before Berlin, the only international trip he’d ever taken was as a schoolkid to nearby Chennai in India. The first few days were just spent soaking in the atmosphere in Holzmarkt, where he’s based — “Just coming here… everywhere I looked, it was something new; something I’d never seen in my life.” He admits he felt overwhelmed by it all at first, feeling more relaxed with each passing day. The number of artists he’s meeting who’re on a similar wavelength as him is far greater than in a city like Colombo, for which he’s very grateful. His primary objective seems to be to learn as much from musicians there as he possibly can. He’s been busy observing crews and collectives and how they thrive in the sprawling Berlin club scene. 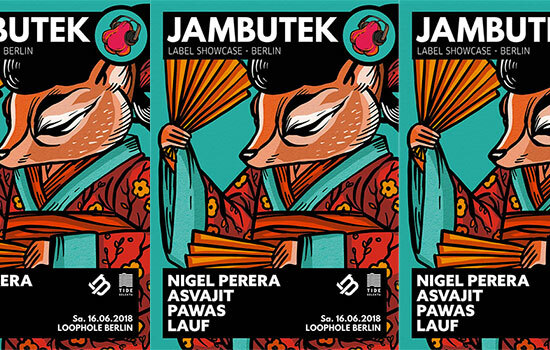 Perera has set up a Jambutek showcase,taking place on 16 June, with Boyle also visiting in early June, he also has a gig lined up at KaterBlau on 17 June. Beyond DJing and producing, Perera is also a visual artist, and he hopes to incorporate some of his visual work into this gig as well, though nothing has been confirmed as yet. Given his inclination towards graphic design, the visual element plays a major role in his creative exploration. He’s in the process of collecting visual content in Berlin, capturing his stay and his experiences there. He wants to work on a corresponding music piece alongside the visuals. Right now though, he’s focussing on stockpiling the content. “I don’t have a clear concept of where to begin; I don’t know right now how to explain what I’m experiencing,” he says. He intends to spend time figuring out a clear structure to these plans. Perera has, through the years, been working out an identity to his music. He has a penchant for house, tinged with some jazz, funk, and soul. There’s a heavy emphasis on rhythmic dynamics in his sound. “The music I tend to make is, I’d say, ‘breaky’. It doesn’t roll. Sometimes, I think I overdo it; I end up doing too many things,” he says. He has a particular fondness for this technique called “microsampling”. He explains: “You take a piece of sound and chop it up into little pieces. It’s a lot of placement, I’d say. I like sampling a lot of old vinyl records, old 70s funk hits; I grew up listening to a lot of old music.” He’s fascinated by the idea of taking a sound — a nice, pleasant chord, for instance — and then warping and twisting it around and forming a whole new sound with it. He’s been collaborating with musicians he’s been meeting in Berlin, just jamming things out to see where it goes. He tells me about his work with an artist named Pablo, a collaboration which has been particularly fruitful for Perera. They’ve been working on an audio-visual piece, which, Perera tells me, follows the pattern of some experiments he’s put out on his Instagram page. Rather than adopting a singular — perhaps insular and restrictive — approach to the residency and narrowing his scope, Perera has instead opted to cast a wide net to maximise his time in Berlin. He’s immersing himself in the scene there, understanding how the live circuit works and the motivations of the musicians and promoters. He’s trying to create as much as he can, collaborating with artists across disciplines and learning from them. And he’s trying to incorporate his visual training into the mix as well. Really, his focus remains on self-growth.